Flowers By Larry made my wedding dreams come true by bringing my whimsical, fairy-tale vision absolutely to life! If 'the devil is in the detail', then I fear that Larry may in fact be the devil, because he puts such charm and character into every little detail, making them tell a story and set the scene. Larry is far more than a florist - he is a true artist, and he is able to capture one's vision and bring it to life in an extraordinary way; his design-skills are impeccable and he and his hard-working team go to great lengths in order to create the perfect backdrop to your perfect day. Thank you Larry and your team for bringing a touch of class and pure magic to our special day! Our guests commented that the flowers were the best wedding flowers that they had *ever* seen. And we couldn't agree more! We'd like to extend our deepest thanks for helping create an absolutely wonderful wedding day! The flowers that you suggested couldn't have been more perfect for our special occasion and we look forward to working with you in the future. Everything you created was AWESOME! Thank you so much for everything you did!!!!! My bouquet was just perfect and I am still looking at it-----you captured everything I wanted!!!! The room was breathtaking with all the details!!!! Hugo was so happy with the candles and Orchids he can't stop talking about your creativity and over the top details!!! Thank you again for a beautiful wedding. My Mother loved her nosgay, and the arbor was so AWESOME and ROMANTIC!!! I can't thank you enough!!!! 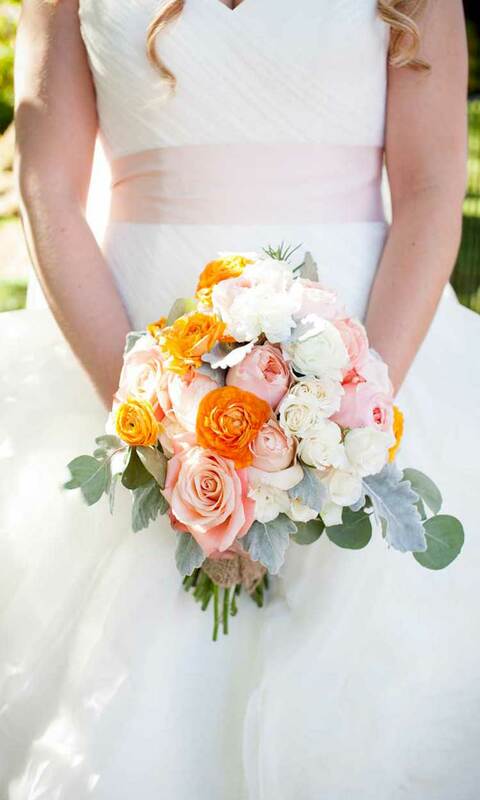 "Everyone was in awe of the flowers at our wedding!.. thank you so much! You took my vision and went above it:) I still can not stop staring at my bouquet!" "THE most wonderful experience and best place to get a dose of beauty and stress relief. Thank you Larry for your amazing shop, gorgeous flowers and attention to detail." Larry made the centerpieces for our daughter's bat mitzvah party and he really wowed everyone including her! He was amazingly gentle and encouraging with her as she tried to decide what she wanted. Watching him work with our teen-ager, made me more patient! The centerpieces were double bubble balls filled with shells and glittering sand castles, coral like pieces and little flickering lights. When she saw the room filled with these centerpieces she said it was more beautiful than she even imagined. Larry is a complete pro. I had absolute confidence in him and he came through for us beautifully. He worked with our time deadlines without any issues. I am so glad we found him and will certainly use him for any future parties and for flowers for whenever! A month after saying “I Do” I am still in awe of the flowers designed by the wonderful Larry Crume. I was confident, like most people, that I could recreate all of the DIY bouquets that I found during my hours of bridal Pinterest surfing. Boy was I wrong! With only a few weeks until the wedding I walked into Flowers by Larry with an urgent plea for help. From the moment I walked into the clever little shop on N. Church Street, I was greeted by a friendly smile and a helpful attitude. Not only did Larry ease my fears, but he completely understood my vision. When the big day arrived I was speechless! His creations were absolutely beautiful and the details were far beyond my expectations. I cannot thank Larry and his team enough for making my wedding day extra special! You have earned a lifelong customer. "Words cannot even begin to express how much Larry means to us. My husband and I got married in May 2013. We knew that Larry was talented, but did not realize HOW talented until we started working with him. From the very beginning, Larry was deeply committed to understanding my vision and carrying it out. Not only did he spend time asking the intentional questions necessary to gain insight into my hopes and dreams for the wedding, but he also offered incredible advice, ideas, and creativity at every angle of the planning process. His experience in the wedding industry is invaluable. Larry knew things that I had never even thought of, and ceaselessly strived to give me everything I longed for, while also remaining realistic and dedicated to my budget. Larry truly cares about his clients. One of my favorite things about Him is how passionate He is- and how his fun personality exudes that passion. Larry went above and beyond time after time to help me visualize our plans and re-construct them when I wasn’t completely satisfied. His heart in making his clients happy is clearly evident, and something I will be forever grateful for! The outcome of our special day was beyond anything I could have ever asked for- from the flower arrangements to the perfectly placed décor- I couldn’t have dreamed it up any more perfectly! Larry is truly one of a kind and we will never be able to express how grateful we are for the impact he made on the biggest day of our lives!" "May weddings are typically beautiful but non more than my daughters wedding, planned and decorated by Larry. We certainly made the right decision when we asked him to be our florist and wedding planner! He listened intently during our planning sessions, as she described the vision she had for her day. She wanted more than just simple flowers, she wanted an experience (a real treat) for her guests. When the day arrived he went far beyond our expectations, with extreme organization and a calming nature, nailing each and every detail! The outcome was magical, truly making it the most special day of her life, one we will always remember with joy and gratitude. Thanks Larry for your incredibly talented mind and hands!" I don't usually write reviews...that being said, I felt compelled to write this one. Planning a wedding as large as mine was daunting to say the least. Approx 400 guests, outdoor...so many endless details to worry about...will it rain? I did not want to hire a wedding planner, because I wanted everything to be perfect exactly the way I had it envisioned in my mind. I wanted every detail to be just right without any outside influences. As I diligently and methodically planned every detail, I kept putting "the flowers" off. They became this enormous component that I could not conquer, for they were beyond important...the right décor, floral arrangements, table settings...when you have tents arranged on acres and acres of land with what appears to be a "sea of tables"...you must have the right décor period! What seemed to be endless bare tables kept haunting me. I needed someone that would listen and capture the essence of spirit I had dreamed about in my mind. I procrastinated on the flowers leaving them to the last detail to finalize. I felt paralyzed not knowing whom to trust...yeah, there were plenty of interested florists that would love to have booked my 400 guest wedding but WHO would be the BEST? Who would be able to handle the volume needed? Who would be able to handle the stress of the limited time left? Who could I ultimately trust? Everyone kept pushing me to book a florist immediately. I needed the RIGHT ONE!!! I did not know Larry...had heard of him, yes...heard he did excellent work. Well, I DO know him now, and I can tell you firsthand...he does beyond excellent work...he is an absolute genius! I walked into his store on Church Street one day, sat down, told him my vision I desired, and within less than ten minutes I knew beyond a shadow of a doubt HE was the one! He not only listened and created EXACTLY what I desired to the last minute detail...he exquisitely filled in the void that I was missing as I described what I wanted. I will never use any other florist again. When you find the perfect one, why would you ever go anywhere else?!!! If you are searching or struggling as I was trying to find that perfect fit to bring to life the magnificent desires you have within your mind for your cherished event you hold so dear to your heart...stop looking because you have just found him, enough said!